Catch me at the ETSY! show in Brooklyn this weekend! 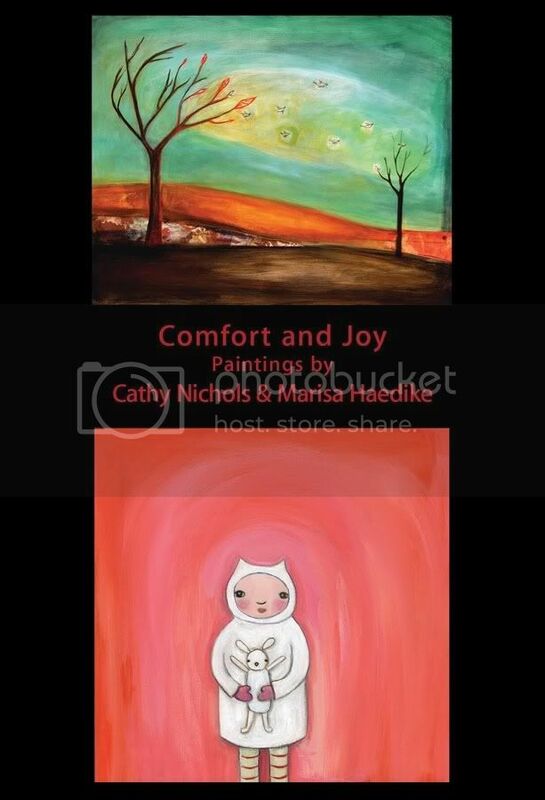 I am so excited to have two pieces on display this month at a special exhibit called "ETSY!" that will be opening in Brooklyn, NY this Sunday, December 2nd at Pocket Utopia and running through December 23rd! 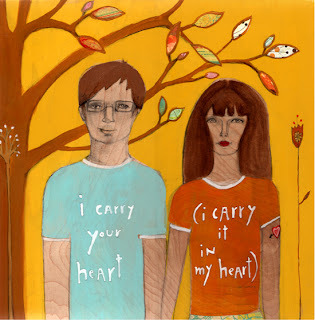 A selection of artists from the hand-made artworld from the online site by the same name (http://www.etsy.com/). Pocket Utopia is pleased to present a selection of artists from Etsy, an online marketplace for buying and selling all things handmade. Etsy was launched in 2005 with the vision of building a new economy and presenting a better choice: Buy, Sell, and Live Handmade. I'm so happy that the kind admins at ETSY have picked up this adorable listing of "Technicolor Holiday" ideas which included my "Peace on Earth" painting! It really puts me in the holiday spirit! This was a nice treat to see when I logged on to ETSY tonight after a long day of painting. Only two days of work left before I will finally deliver my pieces to the East Village Collective. I can't wait to get them out of the apartment. Poor Annabelle can't even play in her 'room' anymore because it doubles as my studio. She can only sleep in there in her crib or risk crawling over paintings in various states of completion. I feel like a bad mommy. But she has lots of fun pushing the dining room chairs around and stealing papa's remote control in the meantime. Please join Marisa Haedike and myself for our 2-person show in Woodstock December 7, 2007 through February 1, 2008 at the East Village Collective Gallery. We will be unveiling about 20 new paintings between the two of us (probably more), so it should be very lively! If you are in the New York area, please stop by. We would love to meet you! Please visit the link to the East Village Collective for more information and driving directions. The opening reception is on the evening of December 7 from 5-9 PM. After many color variations on this painting, I finally realized that it needed something else. I'm much happier with the piece now that it includes this big tree with the little tree carried inside it (and flower with flower inside it). I think it better fits with the poem's theme. And I'm really liking brown, blue and yellow lately. I think those will be the colors of my new living room. We purchased a "mocha" couch yesterday, and now I'm searching for pillows on ETSY. If you have any suggestions, please let me know. 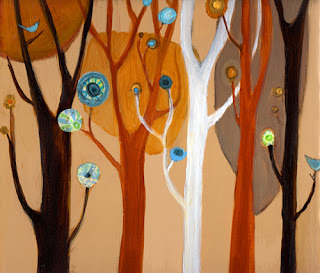 This painting is currently available on my website at http://www.cathynichols.comwww.cathynichols.com. It will soon be going to the Ten Women Gallery in Venice. I love when the internet can connect us with both pictures and words -- and yesterday I received a comment from this great artist above, Darryl Berger. I'm lucky enough to own one of Darryl's small pieces, and he has a print of my "Spun" painting in his studio (upper right). 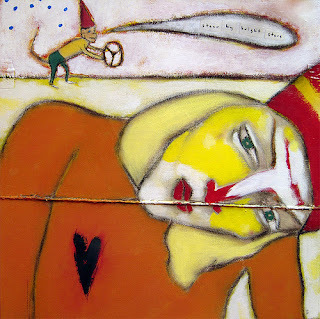 Darryl is a Canadian artist and a prolific writer. Here is one of my favorites from his collection. You can learn more about Darryl and his work on his blog, red-handed. Great stuff! I've titled this entry "never throw anything away" because the orange background for this piece was almost tossed in the trash. This is the underpainting that preceded "it's Okay To Be Different" .... the one that I tucked away on a ledge in the studio in frustration yesterday morning. But today I woke up with visions of an orange garden! I love when that happens. Sometimes I really do think that the paintings are expressing something that is meant to be communicated, and that's why we so often end up with a lovely work that we hadn't intended. This one is also slated for the December show, but prints will be available on ETSY tomorrow. Here is another piece that I completed today. I started out trying to paint an orange painting, but this is, strangely, what came out. It's my new favorite. This one is now on sale as a fine art print on my ETSY store. The original is for the Woodstock show. New Original Paintings On Sale Now! "Never Let You Go." 8x8 inches on wood panel. Well, I've finally updated my website with some of the new paintings I've been doing! There are also quite a few originals not listed for sale because they are slated to appear in my December show at the East Village Collective. I've decided to do paintings on wood for the Ten Women Gallery in Venice (and through my website) and paintings on canvas for the Woodstock show. I'll be sharing this show with Marisa Haedike from Creative Thursday, by the way. It should be LOTS of fun! "Dreaming with the Fish." 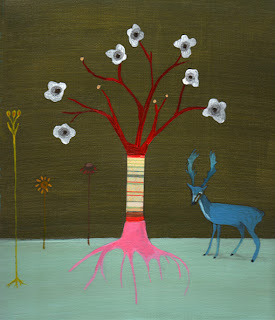 8x8 inches on wood panel. 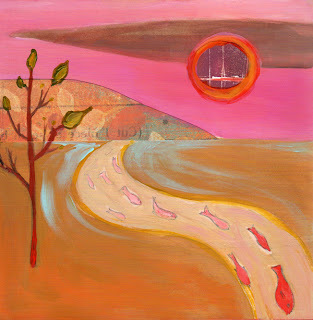 To see more of my new original paintings, please visit www.cathynichols.com. 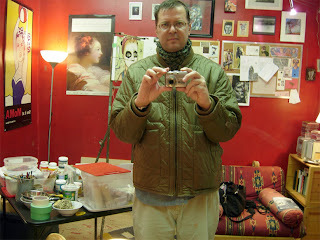 Hi out there all of you kind souls who continue to read my blog despite my recent neglect. I've been painting up a storm (we had a babysitter for a whole week!). We have been looking for a house lately, and I've noticed that almost all of my new work has to do with "home." Here are two recent paintings (more coming soon). 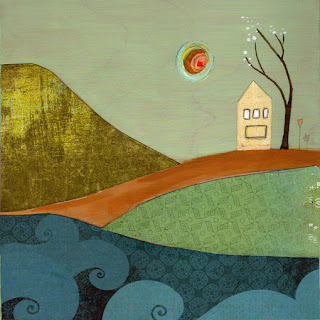 "Home By the Sea" -- 8x8 acrylic & mixed media on wood panel. 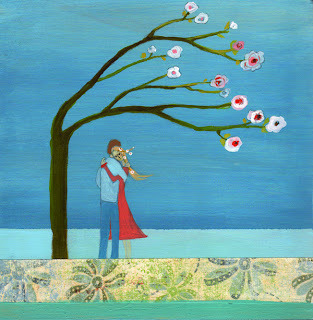 This one was inspired by a recent glimpse of my dream home... by the sea of course. 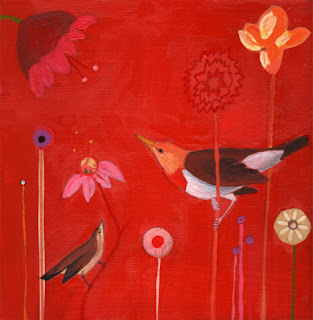 "A Home For Bluebirds" -- this is a 10x10 inch acrylic on canvas painting that I was inspired to do after trying out designmyroom.com. This website is pretty much the most fun I've had after midnight in a long time. It's a virtual decorator program that lets you choose a room, pick paint and add furniture that actually exists (albeit from Target). Plus, well... it would be really cool to live near trees housing bluebirds (rather than 24 hour construction and ambulance sirens here in NYC). These two paintings are available as prints on my ETSY store! From now until Christmas, I will also be including complimentary holiday cards with all purchases. :-).